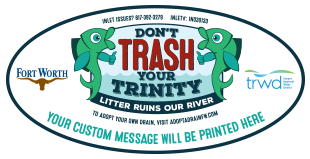 keep the Trinity litter free. at all the drains you adopt. 1 Select a drain to adopt.Click a drain on the map to the left. 2 Give us your custom message during the checkout process.